The Rondish Bed Leaving Mat for the Rise Alarm Kit helps to prevent this reputation. Designed to be used with either a pager or integrated into a nurse call system, it alerts staff to any wanderings and enables them to react before the problem develops. 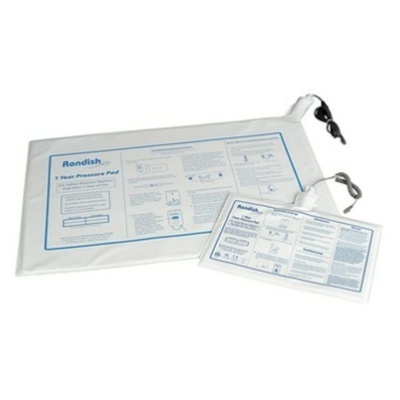 The Rondish Bed Leaving Mat is an ideal way of keeping track of when a patient gets out of bed. Positioned horizontally across the bed behind the shoulders, the alarm is set when weight is placed on it. This way, when a patient sits up, the contact is broken and an alarm sounds, either through the pager or the nurse call system. Staff can then reach the patient before they have the chance to get out of bed. The bed sensor is manufactured by a high quality polyvinyl, ensuring excellent durability and the ability to wipe clean the sensors if required. The bed sensor mat has the following measurements: 30" x 20".